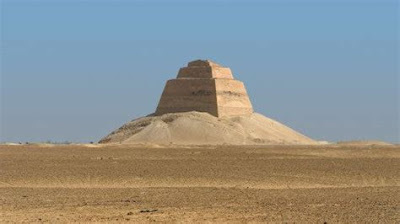 The ruins of the Egyptian Pyramid of Meidum, perhaps the first large building to collapse in history (*). The collapse of large structures is part of a fascinating field of study that we may call "Collapsology." I already wrote a book on this subject, titled "The Seneca Effect" (Springer and Oekom 2017), available in English and in German. Now, I am writing a second book with Springer which expands and goes more in depth into the matter with the idea of being a "collapse manual" dedicated to how to understand, manage, and even profit from collapses. It should be titled "The Seneca Strategy" and it will be available in 2019. About 2,000 years ago, the Roman philosopher Lucius Annaeus Seneca wrote to his friend Licilius noting that "growth is slow, but ruin is rapid". It looks obvious, but it was one of those observations that turn out to be not obvious at all if you go in some depth into their meaning. Do you remember the story of Newton's apple? Everyone knows that apples fall from trees, isn't it obvious? Yes, but it was the start of a chain of thoughts that led Isaac Newton to devise something that was not at all obvious: the law of universal gravitation. It is the same thing for Seneca's observation that "ruin is rapid." Everyone knows that it is true, think of a house of cards. But why is it like this? Seneca's observation - which I dubbed "The Seneca Effect" (or the "Seneca Cliff" or the "Seneca Collapse") is one of the key elements we need to understanding the developments of what we now call the "science of complexity." In the space of a few decades, starting since the 1960s, the development of digital computing has allowed us to tackle problems that, at the time of Newton (not to mention those of Seneca), could not be studied except in a very approximate way. Using system dynamics, network science, agent-based modeling, and more, this new science has allowed us to penetrate a world that in a certain sense was familiar to us: the world of real things that are born, grow, and sometimes collapse in a ruinous way. The basic ideas in the behavior of complex systems are always the same, especially when dealing with collapses: complex systems are complex because they are dominated by the mechanism we call "feedback." Because of feedback effects, a large structure may collapse when just one of the elements that compose them fails. That may lead to the failure of the elements that surround it. These, in turn, cause the failure of other elements of the system, and so it goes. The result is what we call an "avalanche" and, as Seneca said, "ruin is rapid". One question I am often asked about system science is, "can we use it to predict the future?" Alas, there is a small problem with this question: we cannot have exact data on the future because the future doesn't exist (yet). But that doesn't mean that we can try to understand the future. After all, what is the future if not a fan of possibilities that we ourselves may decide to turn into reality? Seneca himself would probably have agreed with this concept: he was deeply involved in the Stoic philosophy. As a good Stoic, he knew that we must always be prepared for the future, knowing full well that ruin can come upon us at any moment. This is true for individuals as well as for an entire society. He himself experienced a "rapid ruin" when his former pupil, Emperor Nero, accused him of treason and ordered him to commit suicide. Seneca had no other choice but to comply. So, we can use mathematical models to describe the Seneca Effect, but they are mainly a quantification of ancient wisdom. It is not a question of predicting the future, it is a question of understanding it. And we can use the models to understand that the ecosystem in which we live is not a supermarket from which we can take what we need - and without even having to pay. It is a complex system, subject to the Seneca Collapse. And since we are also part of the ecosystem, when the ecosystem collapses, we collapse, too. Even a stoic like Seneca would have said that if we have a chance to avoid the climate collapse, we should try. All these things, and many more, I put them together in the book published in 2017 that I titled "The Seneca Effect." Now I am writing another book that should be called "The Seneca Strategy" -- it should be published by Springer in 2019. This second book is more a "collapse manual" that can be used to manage collapses: that is, it explains how to avoid being destroyed by collapses, how to minimize damage, and even how to profit from collapses (hint: have your enemies collapse first!). What I said in my first book remains valid: collapse is not a bug, it is a feature of the universe! (*) Of course, the collapse of the Meidum Pyramid was an inside job. Look at how the building crumbled: would you believe that it collapsed vertically, all in a symmetric heap? No way. And the witnesses of the collapse say that it fell as rapidly as an apple falls from a tree - which is just impossible. So, it was an inside job devised by Pharaoh Sneferu who had his acolytes strategically placing explosive charges within the pyramid. The Pharaoh wanted the pyramid to crumble so that he could accuse the King of Nubya of having thrown it down by having a charioteer throw his horses against the building at full speed. A classic false flag operation. The Club of Rome is inextricably linked to the legendary report that it commissioned to a group of MIT researchers in 1972, "The Limits to Growth." Today, nearly 50 years later, we still have to come to terms with a vision that contradicts the core of some of humankind's most cherished beliefs. The report tells us that we cannot keep growing forever and that we have to stop considering everything we see around us as ours by divine right. Not surprisingly, the report generated strong feelings and, with them, there came plenty of disinformation and legends. Some cast the Club of Rome in the role of a secret organization with dark and dire purposes, others aimed at the Limits report, claiming that it was "wrong" or, worse, purposefully designed to deceive the public. I wrote an entire book on this subject (The Limits to Growth Revisited): in short, most of these stories are false but some contain grains of truth and all of them tell us something about how we humans don't just deny bad news, we tend to demonize the bearers. One of these legends states that the leaders of the Club of Rome disavowed their brainchild, The Limits to Growth and, in doing so, they admitted that it had been not only wrong, but actually an attempt to mislead the public. It is an old legend but, as all legends, it is surprisingly persistent and you can still see it mentioned in recent times (for instance, here and here) as if it were the obvious truth. It is not: it is a good example of how disinformation works. The most compelling criticism of the Limits to Growth simulation, however, was made by the sponsoring Club of Rome itself. Just four years after the foofaraw created by the book's publication and huge circulation -- an incredible 4 million copies were sold -- the Club of Rome "reversed its position" and "came out for more growth" [..] The explanation of this reversal, as reported in "Time" is a masterpiece of face saving double talk. "The Club's founder, Italian industrialist "Aurelio Peccei, says that Limits was intended to jolt people from the comfortable idea that present growth trends could continue indefinitely. That done, he says, the Club could then seek ways to close the widening gap between rich and poor nations -- inequities that, if they continue, could all too easily lead to famine, pollution, and war. The Club's startling shift, Peccei says, is thus not so much a turnabout as part of an evolving strategy"
In other words, the Club of Rome sponsored and disseminated untruths in an attempt to scare us. Having scared many people with these lies, the Club can now tell people the real truth. So, where does all that come from? I can't find on the Web the original "Time" article that Simon cites, but there are other reports available on the declarations that Aurelio Peccei (founder, and at the time president, of the Club of Rome) released in 1976, during a meeting held in Philadelphia. The journalists who interviewed Peccei were impressed by what they perceived as a reversal of previous Club's policies, to the point that Newsweek titled its report (according to the St. Louis Post) "Has the Club of Rome publicly abjured?" Peccei was said (according to the New York Times) to have stated that, "Naturally, we realize that no-growth is neither possible nor desirable,"
An erroneous image of the Club has, therefore, formed as a group advocating zero growth. Again, the possible consequences of unregulated growth of the industrialized societies and, still more, those which would arise if growth were abruptly brought to a halt, has disturbed some of the less developed countries where, we have already said, the report is all too easily seen as a selfish proposal from the developed world which would still further aggravate the difficulties of the great mass of underprivileged on our planet. And that is not a "face-saving double talk," as Simon claimed. It is a necessary consequence of the views of the Club from its formation. 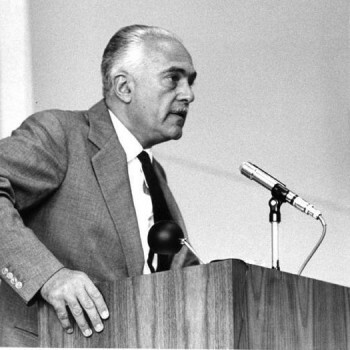 Aurelio Peccei had started the Club on the basis of what he called the "problematique" or the "predicament" of humankind. From his first public speech on this subject, in 1965 (you can find it here), it is clear that he saw the problems facing humankind mainly in terms of a fair distribution of the available resources, avoidance of wars, elimination of poverty, health care for everyone, and the like. (see also this post by Irv Mills). Peccei didn't imagine the future of humankind in terms of a collapse: the concept of "overshoot and collapse" of socioeconomic systems didn't exist at that time, it was developed and diffused only in the 1970s by Jay Forrester. So, the results of "The Limits to Growth" study, with their scenarios of probable collapse, must have been a shock for Peccei and the other members of the Club of Rome. Still, it is clear from what they wrote afterward that they understood the logic and the consequences of the report they had commissioned - they never "disavowed" it, even though over the years some individual members criticized the study in various ways, but that's anther story. And here we are: no lies, no disavowal, no scare tactics. What we have, instead, is a stark reminder of how disinformation works. Note the narrative technique used by Simon: he says that "Having scared many people with these lies, the Club can now tell people the real truth." You need about 3 seconds to deconstruct this statement and note how it makes no sense: if the Club successfully told lies to the public, why should it stop doing that? What could the Club possibly gain by publicly confessing of having lied? But narrative follows special rules and what we have here is a common trope of many modern movies: at some moment, the villains may explicitly confess their crimes (sometimes called badass boast) out of pure arrogance. So, the trick Simon is using here is to cast the Club of Rome into the role of the villains in narrative terms. It is an effective trick in an age in which we can't distinguish reality from narrative anymore: it is the dark art called "creating one's own reality." Nearly 50 years have passed since the Limits report was published and it is safe to say that most people remember it the way it was described by the propaganda of the 1990s, as a "wrong-headed" study (if they remember it at all). But does that mean that it has been forgotten forever? While it is true that "Google Trends" doesn't show any increased interest in the "Limits" itself, there is growing interest in the concept of slowing down economic growth or avoiding altoghether. And "The Limits to Growth" is showing a remarkable return of interest in the scientific literature. Does that means we will see a return of interest in it also in the mainstream debate? Why not? After all, in the long run, truth always beats disinformation. Time magazine wrote recently in an essay on futurology, "Men hunger for predictions as they hunger for bread in a famine." The starving have recently been thrown a few loaves by the self-appointed prophets of the twentieth century. The oracular prophecies out of the computer have been muted since the oil crisis of 1973 broke the back of their optimistic curves of growth. The guild of soothsayers fell out of favor. Now after a long penitent silence they are making a comeback. Herman Kahn, director of the Hudson Institute and an unshakable optimist, has published a new study of the future entitled. "The Next 200 Years." His conclusion is that in the year 2176 the world population will have reached a total of 15 billion and will be living comfortable with a per ants than were predicted for 1975. The Wall Street Journal says the dreams of unlimited energy, cheap nuclear-generated electricity, fivefold increase in farm yields and the final victory over cancer before the end of the century can be forgotten. The "revised future" looks somewhat different. By the year 2000 food will be three times as dear as it is now, hot counting currency inflation. Automatic highways will not be built. At best, automobiles will have a more efficient fuel consumption. The super-jumbo jets with 1000 seats will not be flying by the end of the '70s, but at the earliest, by the '90s. The future was being revised in Philadelphia also. "Has the Club of Rome publicly abjured?" asked Newsweek, in view of its new slogan. The club, a loose association of about 100 industrialists and academics from various countries, has been regarded so far as a stern warning against too optimistic forecasts. If the present growth trend continues, it said in 1972, the limits of growth would be reached sometime within the next 100 years. Aurelio Peccei, founder of the Club of Rome, denied in Philadelphia that its members had put themselves forward as capita income of about $20,000. Kahn's collaborator, Edmund Still-man, in a study commissioned by a French private bank, prophesies a particularly rosy future for the French. Very soon after 1980 France will overtake West Germany in production of goods and services to become Number One in Europe. The "Club of Rome," which in 1972 postulated the "limits of growth" and attracted powerful criticism, has come up with a slightly less pessimistic view of the world. Its new motto is "organic growth" and the optimistic slogan for its latest congress in Philadelphia was "New Horizons for Humanity." In a 10-part series the Wall Street Journal discusses which of the prophecies made 10 years ago have come true and which of them have to be corrected. The paper's researchers have found that the biggest mistake made by the futurologists has been their projections of population growth. On the one hand a birth explosion and a declining death rate in the developing countries have combined to increase the total world population much faster than anticipated. But in the United States, for instance, the trend is reversed. Already now there are 12,000,000 fewer inhabit advocates of zero population growth. Their study "Limits of Growth" which has sold in the meantime, 2,000,-000 copies was only intended, he says as a shock and a way of directing public attention to the problems. "Naturally we realize that no-growth is neither possible nor desirable," he said. According to the modified formula, developed by the West German, Prof. Eduard Pestel, and his American colleague, Mihailo Mesarovic, what is needed now is "directed growth." "The important thing is in which way growth takes place, with what technology and in what branches of the economy," said Professor Ervin Laszlo of the United Nations Institute for Training and Research. The outlines of a new world economic order are being drawn up in a new study commissioned by the Club of Rome from the Dutch economist and Nobel prizewinner Jan Tinbergen. Working with 20 other experts, he expects to have it ready by autumn of this year. The rough outline was already plain in Philadelphia larger currency reserves for the speedier financing of development projects in the Third World, stricter control of the multinational concerns and a world-wide co-ordinator of energy 'Men hunger for predictions as they hunger for bread in a famine . . . Suddenly, we discovered that plastic pollution is a problem, a big one. What to do about it? As usual, it is a question of governance: the problem in itself is not so terribly bad that it couldn't be controlled. But, over the years, we developed such effective technologies of anti-governance that we have entered now "the age of unsolvable problems". How bad is the situation with plastic pollution? Rather bad, by all means. Citing from a recent paper by Geyer et al., more than 8 billion tons of plastic have been produced since the 1950s. Of this mass, 9% percent was recycled, 12% was incinerated, the rest is still around. 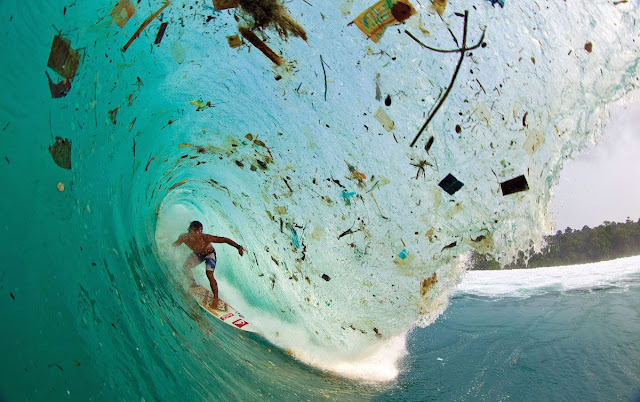 It is this mass of plastics, billions of tons, which generates the pollution we see today. It is almost one ton of plastic waste for every human being living today. Imagine if it were magically to appear in your living room: one ton for every member of your family! Still following Geyer et al., we learn that, in 2015, the world produced 380 million tons of plastics from fossil hydrocarbons. To get some idea of how polluting this mass is, we can compare it to the total carbon emissions produced by hydrocarbon combustion, around 9 billion tons per year. As an order of magnitude comparison, we can say that about 4% of the fossil hydrocarbons we extract become plastics. 4% doesn't seem to be a large amount, but it is not negligible, either. Apart from the horrible state of some beaches and the islands of plastics in the oceans, it is a lot of carbon pumped into the ecosystems. Its effects are unknown, especially on humans: we are all eating microplastic particles, today. What will that do to our health, nobody knows -- we are all guinea pigs in a great experiment. The long-run problem is that all this plastic is made from fossil hydrocarbons, so it is going to be gradually oxidized and turned into gaseous CO2. Then, it will contribute to global warming. So, we have a problem and not a small one. Then, how do we deal with it? The Greens in their various shades will respond with the magic words "recycle!" or "reuse!" but there is a little problem here: you can't recycle or reuse anything for more than a limited number of times. Recycling plastics is just a way to procrastinate the unavoidable: you may know the quote (attributed to Christopher Parker), "Procrastination is like a credit card; it’s a lot of fun until you get the bill." Eventually, even recycled/reused plastics must become waste and at that point, we get the pollution bill to pay. A different brand of problem solvers, maybe we could call them the "anti-Greens," will come up with a completely different strategy: "let's burn it!" Yes, sure, after it is burned, we don't see it anymore -- which means it has disappeared, right? And, in the process, we magically create energy! Isn't that a good idea? Maybe it is, but if there ever was a perfect illustration of the concept of "sweeping the problem under the carpet," this would be it. When burned, the stuff plastic is made of doesn't disappear -- it is simply turned into CO2 which then goes into the atmosphere to create more global warming. And the energy we can get from incineration is just a trifle and it is obtained in a dirty and inefficient manner. There is a third brand of people I could call the "bring me a problem and I'll show you an opportunity." They take notice that there exists something called "bioplastics" which doesn't generate extra greenhouse gases and is bio-degradable, at least in principle. So, it could solve the problem while keeping everything the way it is in the best of possible worlds. They know that, nowadays, weight for weight, bioplastics cost 2-3 times more than ordinary plastics made from fossil fuels but, hey, higher prices mean higher profits! After all, the fraction of the budget that an ordinary family can't be but small, so they can afford to pay a little more. Besides, technological progress will surely bring costs down. And when they discover that bioplastic production today is only about 4 million tons (1% of the total production of plastics), wow! Think of the possibilities of growth!! But is bioplastic the solution to the problem? As it often happens, quantification makes short work of ideas that seemed to be good in theory. Today, bioplastics are made mainly from cereals (corn) or directly from sugar. According to the data from Statista, the world's production of sugar was about 170 million tons in 2017, less than half the amount needed to make the currently produced amounts of plastics even in the wildly optimistic assumption of a 100% efficient process. About cereals, the data tell us that in crop year 2016/2017, a total of approximately 2.62 billion metric tons of cereals were produced worldwide. Again in the wildly optimistic assumption of a 100% efficient production process, it means we should set aside about 15% of the world's cereal production - more realistically about 20%-25%. Then, of course, efficiency can be improved and we may find ways to make plastic out of plants not used as food. But, at present, it is the way things stand. Think for a moment of what losing 25% of the food production to make bioplastics would mean for a world where billions of people live on the edge of starvation. You see that we have a little problem, here -- similar to the one that would come if we were to try to switch from fossil fuels to biofuels. And I am not saying anything about the fact that agriculture is far from being fossil-free, not at all: think of fertilizers, pesticides, transportation, refrigeration, processing, and more. Think also that, the way it is performed nowadays, agriculture is an unsustainable process that destroys the fertile soil that it needs to produce food. There is just so much that agriculture can do: it can't feed more than 7 billion people and, at the same time, provide fiber, chemicals, and fuel for everybody. Does that mean that the problem of plastic pollution unsolvable? No. It is, actually, a minor problem in comparison to other, much more difficult problems we face. We need to phase out fossil fuels from the world's economy but, if we were to do that very rapidly, the world's economy would cease to function. But we could phase out fossil-based plastics tomorrow. It would be uncomfortable and complicated, but nobody would die and we would rapidly adapt to new ways to do everything we do today, just using something else: metals, paper, ceramic, tissue, or whatever at hand -- even nothing in some cases. And we don't even need to phase-out plastics completely: in some areas, plastic materials are really indispensable, think of one-use medical equipment or rubber tires for road vehicles. But, in that case, we can use bioplastics: if we use it in limited amounts, it is possible. What we have to do is just to eliminate the wasteful and frankly stupid one-use plastic items: plastic bottles, spoons, forks, dishes, and the like. It is, in the end, not a technological problem: it is a problem of governance: we, humankind, have been able to manage reasonably well the elimination of some harmful substance from industrial production. Think of lead as a component of paints or in gasoline. Think of mercury in thermometers, beryllium in some alloys, CFCs in refrigerators, DDT as an insecticide, and many more cases. International agreements were discussed, approved, and implemented. Then, these and many more substances were banned and removed from industrial use. It is possible and it has been done. So, it would be perfectly possible to develop and implement international agreements that would curb the use of plastics made from fossil fuels and eventually ban it completely. That implies changing something in our everyday life: the "overpackaged" products that today are so common in supermarket aisles would have to disappear. Packaging is not evil: it is a way to store and ship food - we need to use it as needed, no more. So theoretically, it should be possible -- even reasonably easy -- to eliminate plastics pollution by means of international legislative action but, in practice, it looks difficult. Over the years, efficient technologies of anti-governance (aka good old disinformation) have been developed and honed to near perfection -- we saw them applied to the issue of global warming. These technologies can be used by industrial lobbies to stop all legislative changes that would reduce their profits. That has made every problem impossible to solve. Right now, the fossil fuel industry is desperately fighting to survive. It has been able to successfully stop many attempts to do something against climate change. It is at least unlikely that it will stay silent while it loses a market worth some 600 billion dollars per year. So, expect soon a loud campaign in favor of plastics: some hints are already starting to appear (*). And they will blame you for not sorting your waste properly! If the campaign to keep fossil plastics will work, then the only way to get rid of the stuff will be a full-fledged Seneca Collapse. That is, if humans can't reduce by themselves the amount of fossil plastics they use, the system will crash and force them to reduce it. This kind of crashes have happened in the past, they can surely happen again. (*) The article cited on WSJ is paywalled, but the gist of it is based on an earlier article on NPR which notes how the number of plastic straws used yearly in the US is usually overestimated (500 million per day) and that the person who generated it a few years ago (Milo Cress) now admits it was just a guess. Because of this, the WSJ writer, James Freeman, concludes that the whole anti-plastics campaign is a scam designed to have you pay more money to the Green PTBs, out there. It is a standard disinformation technique based on cherry picking. They can do much better than this - you'll see that soon! In 2018, the fires in California and in other parts of the world have been especially devastating. But they had little or no effect on people's perception of global warming and climate change. It seems that we are operating on the basis of a wrong model of governance: the bottom-up mechanism is simply not working. This year, we had the largest forest fires ever seen in history in California. And we had terrible forest fires in Greece, Portugal, and Scandinavia. Climate scientists were quick in stating that these fires were made more likely and more severe by global warming, but you don't need to be a climate scientist to understand that higher temperatures mean drier conditions and more fires. Then, if you live, as I do, in a bubble in the memesphere where climate change is regarded as a serious and imminent problem, you surely had the impression that the fires of this summer was an important factor in affecting the perception of the general public. All that sound and fury couldn't signify nothing, right? I saw several self-congratulatory messages in the meme bubble stating something like, "now they will start understanding the problem of climate change!" Alas, that's not true. The results are stark clear: there is NO evidence of an increased public interest in global warming as a result of the fires. Below, you can see the results of a search on Google Trends for the United States. These data record the number of times that a certain term was searched on the Google Search Engine. Note how the interest in the term "wildfires" spikes up in correspondence with major wildfire events. You can see in the graph the three California fires of 2017, August, October, and November. You can also see the rising interest in the 2018 fires. But climate change? No detectable effect. At best, a very minor increase, not even compensating the decline generated by the Trump administration starting to use deception by omission. (note how the spike in interest in climate change in 2017 is the result of Trump's announcement that the US would withdraw from the Paris treaty). Other countries showed the same pattern: I could detect some rising interest in climate during the 2018 fire season only in France, in Germany, and in some other countries of central Europe. A minor effect, anyway. All that is nothing less than stunning. We had this big disaster, fires everywhere, giant columns of smoke, incinerated buildings, all pointing directly to global warming. Of course, it is possible to argue that there are other factors that caused the fires, but at least you would think that people would have been stimulated to look over the Web on the subject. Instead, nothing, zero, null, zilch, nada. No detectable rise in interest in climate change despite the fires. People just didn't make the connection. So, what's happening? One of the problems is that the media didn't emphasize the climate factor in causing the fires. The many articles published on the subject normally contained a few sentences about the effects of climate change buried somewhere in the text, but the subject never appeared in the title and was never emphasized in the summaries. But it was not a conspiracy of the media: simply, they found that mentioning climate change in the news about the fires was a "palpable ratings killer." So, the media had no interest in diffusing a subject that the public found uninteresting and the public found the subject uninteresting because it was not diffused by the media. It is a damping feedback which is gradually marginalizing climate change to the status of a non-problem. (see this post on Cassandra's Legacy and this article). In the end, the problem is that we have a wrong model for how to generate action against climate change. We tend to think that, as the change becomes more evident in the form of major disasters, people will take notice and that will force politicians and opinion leaders to do something. That's not happening. We are having giant fires, scorching heatwaves, and droughts, besides, of course, rising temperatures. But people don't care if they are not directly affected and, if they are, they have other priorities than worrying about climate change. The bottom-up model of diffusion of the climate change meme is simply not working. So, what do we need? One thing that can be said is that no major environmental problem was ever solved by means of a bottom-up meme diffusion mechanism: refrigerator owners never pushed for their CFC refrigerating fluid to be replaced with non-ozone depleting fluids. Instead, manufacturers were forced by law to stop their production of CFCs. We need to find a way to go in that direction in order to stop greenhouse emissions, hoping that it is not too late. As a further note, during this year's fire season, I published a comment on an Italian newspaper on the fires in Greece, trying to highlight the connection with climate change. The result was discouraging: most commenters angrily disagreed with me and much preferred a conspiracy theory that attributed the fires to "arsonists." It seems that not only people can't see the connection between forest fires and climate change, they become positively angry when it is pointed out to them. The figure is taken from the "Independent" dated 23 November 2016. It is an example of propaganda techniques based on spin and omission. We live today in a true Empire of Lies. By mere chance, I happened to stumble into the graph you see above. It bothered me: can it really be that Russia is, by far, is the most unequal country in the world? It just didn't fit with what I know of Russia. Yet, the power of well-presented graphic information is such that for a while I tried to rationalize these data in my mind. Maybe the fall of Communism really caused some kind of terrible unbalancing of the Russian society. Scratching my head, I thought that I had to check the data. Perusing the Internet on this matter, I found several other 2016 reports in the mainstream media about the alleged high inequality of the Russian society. In a 2016 article on CNN, you can read that "Russia is the most unequal major economy in the world," while on "Radio Free Europe" they say that "wealth disparity in Russia is unparalleled." But there is something wrong with these reports. I checked with the World Bank, I checked with the "World Inequality Database," I checked with the Statista site. I even checked the CIA Factbook, not exactly people known for their sympathies for those evil Russians. The result was always the same: Russia is NOT the most unequal country in the world. "Inequality" is a wide-ranging concept that can be measured in various ways but, in general, Russia is ranked at about the same level as the United States and at much lower levels of inequality than countries like India or Brazil. So, what are these reports based on? CNN doesn't provide links to their sources, but they refer to a company called "New World Wealth." Radio Free Europe cites one Mr. Tony Shorroks of a company called "Global Economic Perspectives." Neither source seems to be very reliable. A company called "New World Wealth" has a Web Site but, frankly, it looks like a fake company: their "reports" are simply links to the site of a bank in Mauritius and, in any case, none of them says anything about social inequality in Russia. As for Mr. Shorroks' company, it seems to exist in London, but it doesn't even have a Web address - it is hard to think that it can perform an independent economic analysis of the Russian Federation. How about the data on the Independent? The number provided for Russia just doesn't seem to be right. According to the World Inequality Database, the share of wealth of the top 1% of the Russian population is around 42%, not 74.5%. Again, they don't provide a link but, after some work, the 74.5% value can be found buried in a table at page 145 of a report published by Credit Suisse (h/t Alien Observer). How is it that this number is so different than others is probably because of the data the Credit Suisse use are incomplete, as they themselves say. In any case, the wealth of the top 1% is a very partial tool to measure how unequal a society is. It only tells you something about the existence of an upper crust of super-rich people, whose wealth is very difficult to estimate anyway. It tells you nothing on how wealth is distributed among the rest of society, the poor and the middle class. So, among the data available in several reports, the Independent chose the only number they could find that gave them the possibility of denigrating Russia -- conveniently forgetting to cite all the others. But that's the way propaganda works. Good propaganda - better defined as "perception management" - is not about telling lies, it is about distorting the truth, typically, by means of the three basic propaganda techniques: omission, spin, and saturation. Here, we have a classic case: the data which agree with a certain interpretation are cited (spin), the others are ignored (omission). The interesting point, here, is that I could find nothing on the Web that challenged these stories about inequality in Russia. It seems that most people are too busy and distracted to have the time and the inclination to check the data they read in the media. So, the concept of "high inequality in Russia" just flashes up in people's perception and then it becomes part of a diffuse worldview. So, here we are: the whole issue is not so much about Russia, it is about how blatantly they can lie to us and get away with that. How about much darker things for which we have no reliable sources? How can we believe in anything we read in the media? And note that this is not the kind of fake news diffused by amateurs on the social media. These are news appearing on major media outlets which, by the way, often claim to be fighting fake news. Maybe lies are not a bug but a feature of our society. It seems to be true that we can "create our own reality," as an aide to Donald Rumsfeld is reported to have said at the time of the invasion of Iraq. So we are creating a true "Empire of Lies" and that's not a good thing. Some more info on inequality in Russia. Here is a graph from the "World Inequality Database"
As you can see, inequality in Russia increased after the fall of the Soviet Union but, later on, it started to go down with the economic recovery. Recently, however, it went up again, most likely because of the strain on the economy imposed by the international sanctions. Still, the current value of about 42% for the 1% share doesn't compare with the 74.5% value given by the Independent. Here are, instead, the data for the US. The graph is a little outdated. Today, the 1% share in the US is higher than it was in 2014 and about the same as it is in Russia. Note also that these data are only about personal wealth but say nothing about other factors, such having a health insurance, which is provided for free by the state to Russian citizens, but not to American ones. About the growing inequality trend, maybe it is correlated to the oil production peak in the US - in any case, today the level of inequality in the US is close to that of England in the 18th century.